The Chinese artist Junli Du is bridging a gap between the past and the future by letting the spectator appreciate the symbols and themes picked from Chinese custom and, simultaneously, new and creative renditions of them. Contrasting Souls discloses his tendency to balance characters, subjects and depictions belonging to the Chinese tradition with new elements, textures, colours, and feeling coming from a culturally modern and fluid environment. 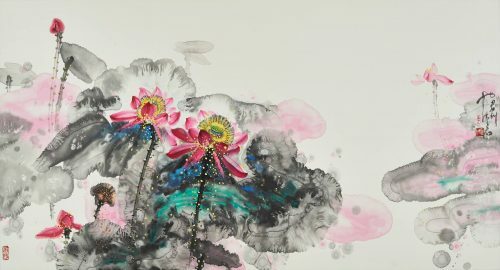 Those two contrasting but harmonious souls are coexisting in the artist’s production since his paintings still comply with the technic of ink of Chinese painting, and some even reveal the traces of ancient murals. However, the brightness, saturation, and contrast of colour used are undeniably unique. Shown for the very first time in France, Junli Du’s solo exhibition at the Galerie New Image will feature artworks from his most well-known series: the figure paintings and the flower series. The traditional Chinese iconography and ink painting technique find new light in Mr. Du’s works, reopening the discourse about the preservation of local cultural and artistic heritage. Contrasting Souls is intended to create a dialogue between his conservative attitude and his new inspiration. In the series of dramatic figures exhibited, the paintings and brushwork are combined with the expression of western oil painting, making the characters like full of flames, under the visible influence of Vincent Van Gogh and Salvador Dali. This exhibition is organized by MBA students from the Ecole Marché de l’art et Métiers de la Culture (IESA), Paris.